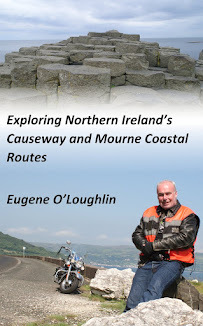 My toughest critic, when she finished reading Exploring Northern Ireland's Causeway and Mourne Coastal Routes, said "ABC: another bloody castle - castles here, castles there, castles every feckin' where - I'm fed up of castles". Indeed - there are a lot of castles on the Irish coastline, that's where the people that built them decided to put them. Also - towards the end of the book there is not too much scenery (apart from the Mourne Mountains), and most of the interesting things to see are castles and old buildings. I must keep this criticism in mind when completing my trilogy of exploring our coast as I write Exploring Ireland's East and Southeast Coasts. The critic who uttered the above words? My Mum!